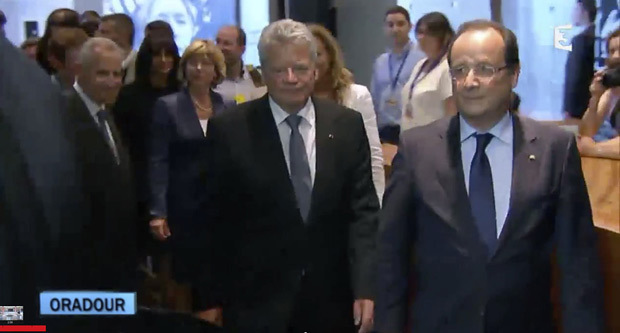 François Hollande and Joachim Gauck, as seen on TV, with Marissa’s photograph of Setsuko Iwamoto on a banner in the background. The Presidents of France and Germany met in Oradour on September 5th, 2013, to commemorate 70 years since the local massacre. Part of the reception was held at Centre de la mémoire, the venue hosting the “Women and War” exhibition through April, 2014.